Bewcastle is a long way north of Brampton, a long way north of Hadrian’s Wall. 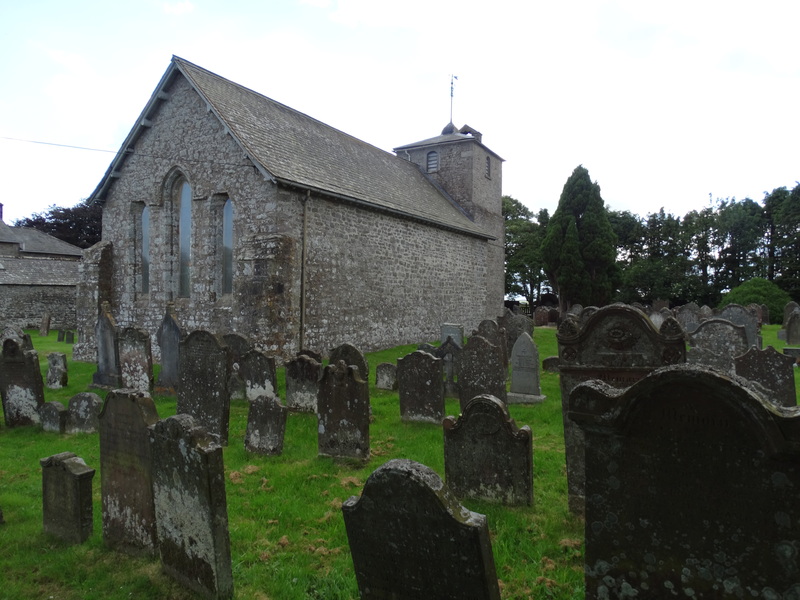 Very good village website with pages for the church, the castle, the museum, etc. When the Wall was built in 122 AD this was one of the outpost forts, probably known as Fanum Cocidii, adopting the name of the local god Cocidius. It was built of turf and wood and, very unusually, had six sides. It was manned (saying a roman fort was “staffed” seems too pc) by the First Nervan Cohort of Germans. It was rebuilt in stone, and lasted until 367. You can pick out bits of it if you have a proper explore – I didn’t. A timber castle was erected soon after 1092, using roman ditches, and this was rebuilt in stone between 1340 and 1360 by John de Strivelyn, one of Edward III’s generals. It was abandoned about 1640. I should have walked up and had a proper look – the site has free access and the website says there is a guidebook available at the farm. A job for another visit. 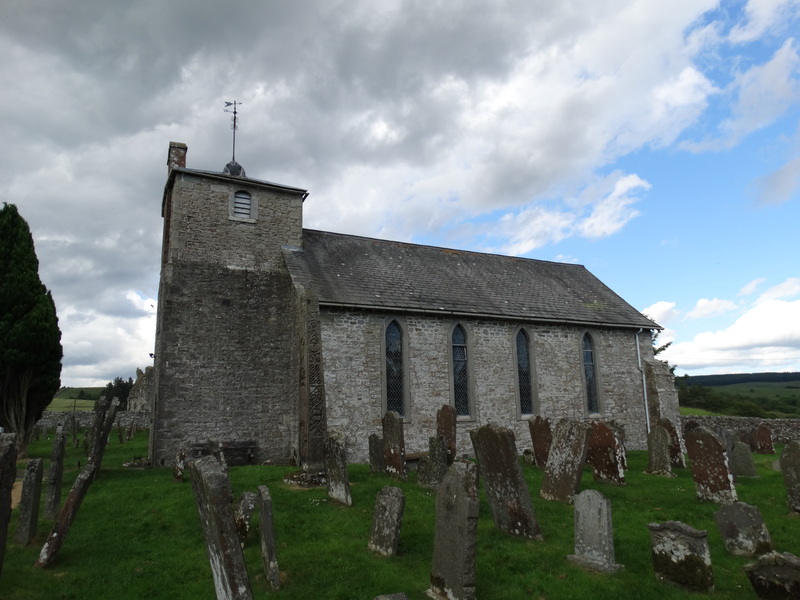 The church may have its origins in a monastic cell in the remains of the roman fort. 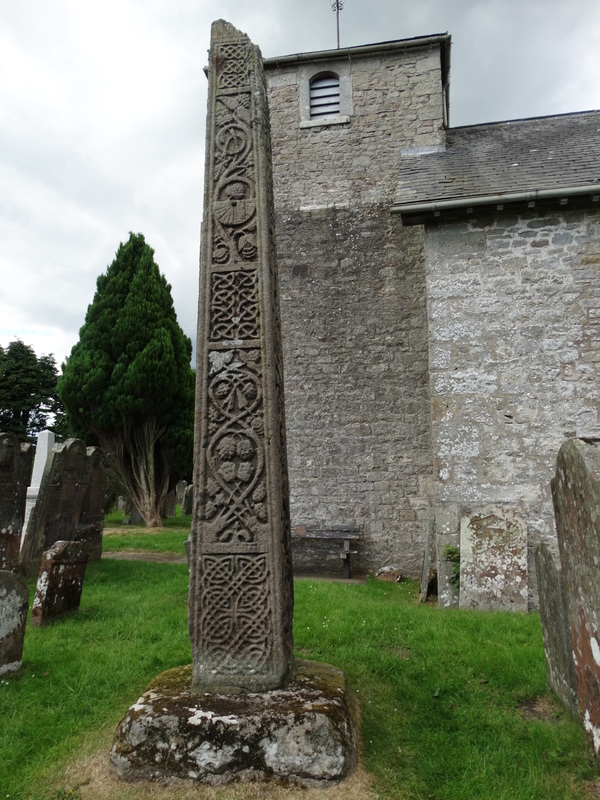 If the C7 cross (see below) is in its original place, it would suggest there was a religious building here then. The earliest recorded church dates to 1277, and the east end remains. In 1291 church commissioners valued the property at barely £19. Scottish raiders ensured it never reached the next audit. 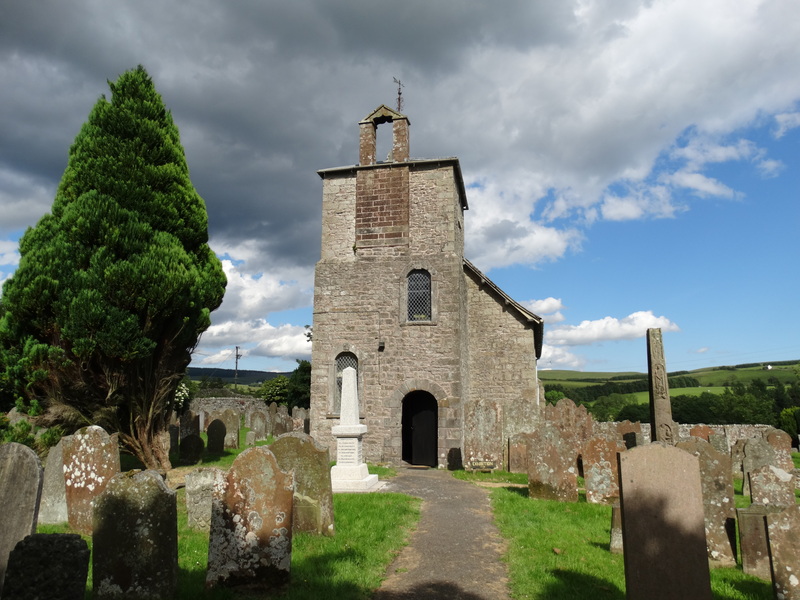 In 1604 the church was roofless and a century later the Bishop of Carlisle lamented its state. 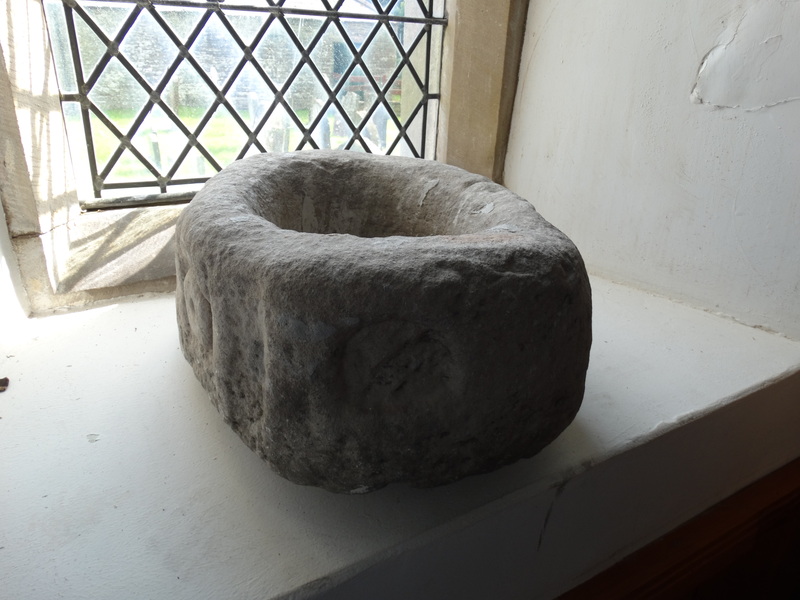 He also said the font “looks like a swine’s trough.” The present church was rebuilt in 1792, and re-ordered in 1901. Millennium window added a century later. The church was open and welcoming, with a little bookstall (even mugs available). You can read the village magazine on the website – with a very amusing and positive letter from Philip the Vicar. “During the Archdeacon’s long sermon at the recent service for the swearing-in of our Churchwardens I began to day-dream. When I later analysed my train of thought I could see how each image led me to the next until my attention was brought back to the present with our Churchwardens sat around me and the Archdeacon still in full flow.” (I should remind Ponteland readers that we are in a different diocese, so our Archdeacons are not those accused!). He praises churchwardens for their hard work – Amen to that. 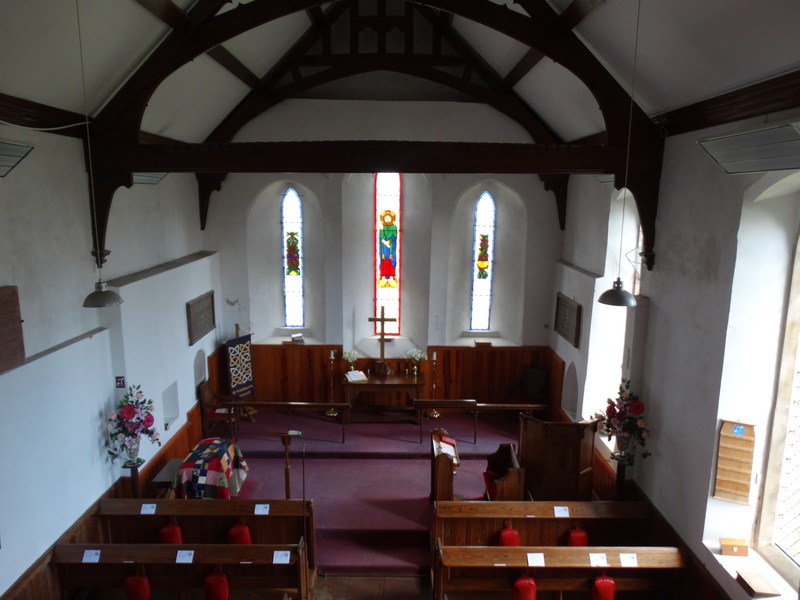 (When I was looking after seven Suffolk churches that meant fourteen churchwardens. When they all turned up with their staves, it looked liked the prelude to some ancient English folk dance). 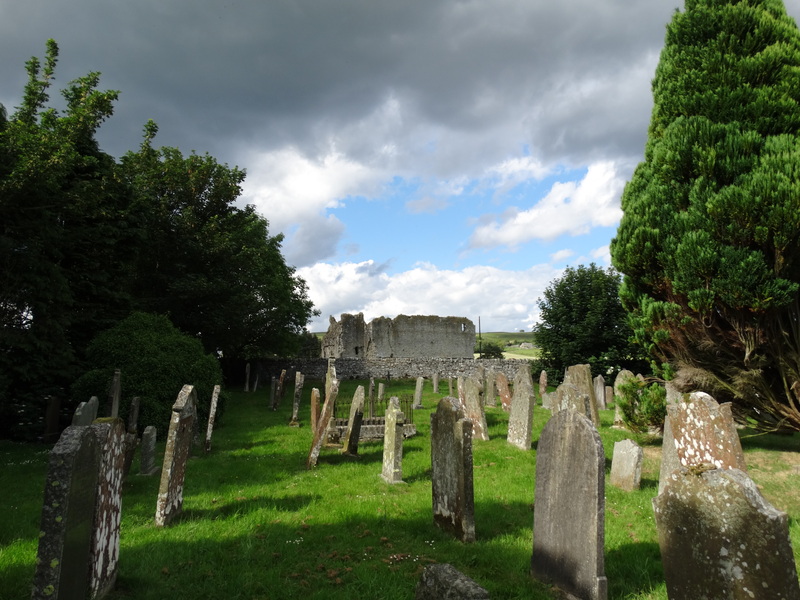 The churchyard has wonderful views, including across to the castle. 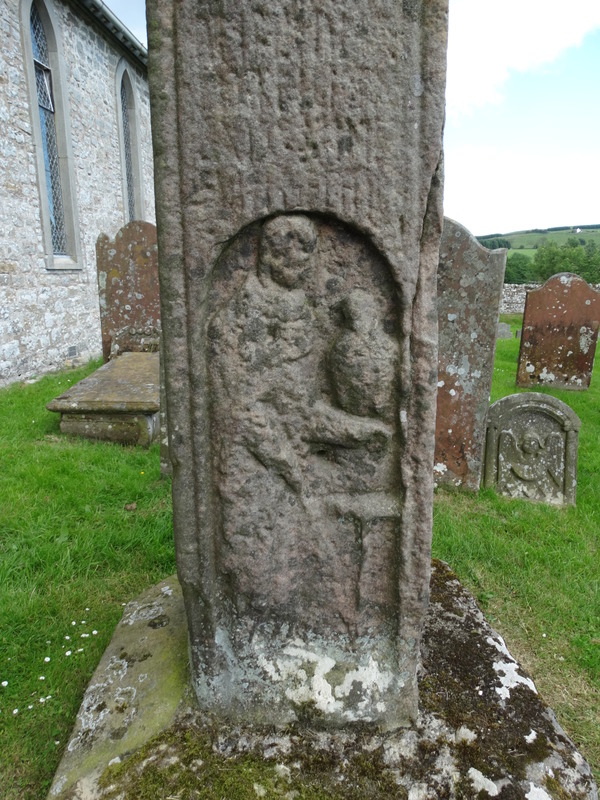 Legend has it that only women are buried in the churchyard – the men were hanged in Carlisle; we are in Border reiver country. For southern readers, “reivers” are Northern, Border, lawless gangs – with the emphasis on “lawless” (see http://www.borderreivers.co.uk/). 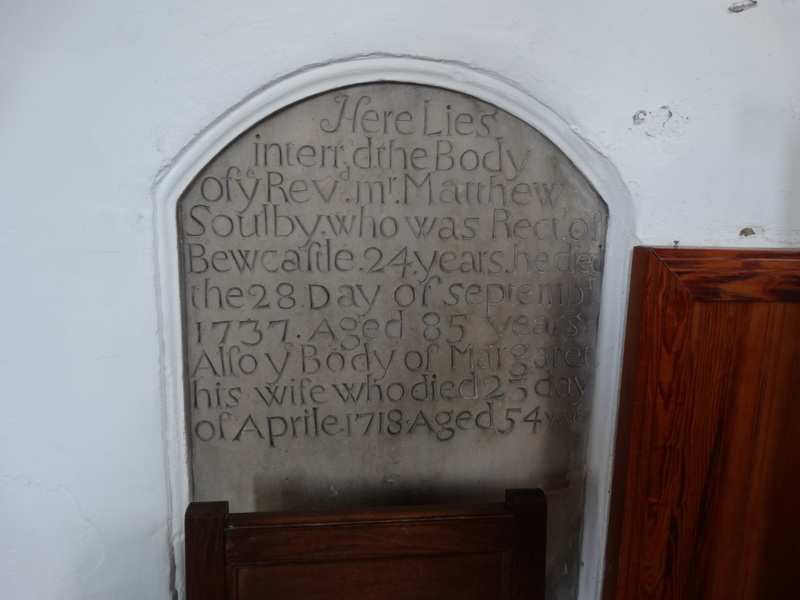 Lots of reiver names, Armstrong, Elliott, Nixon and Routledge – the oldest headstone is dated 1698. 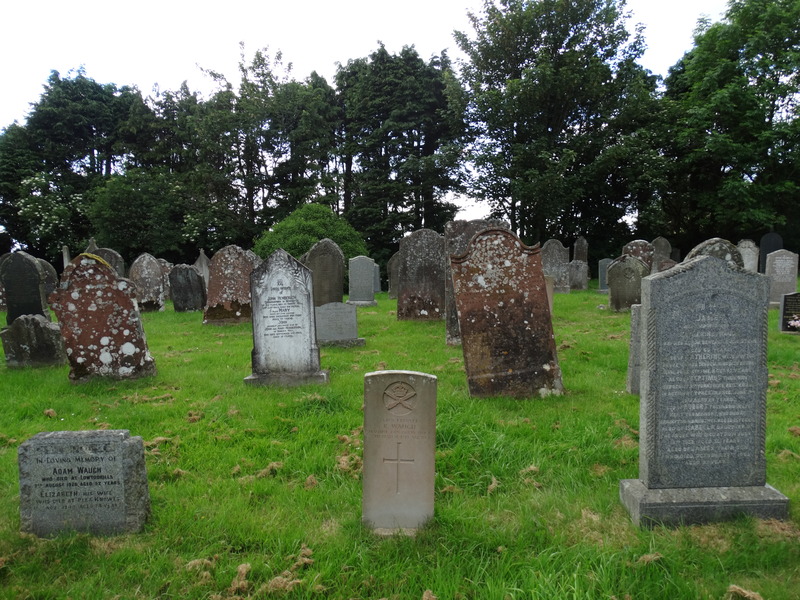 (This is one of those villages where someone has done a lot of work transcribing headstones and registers – more details on the website). 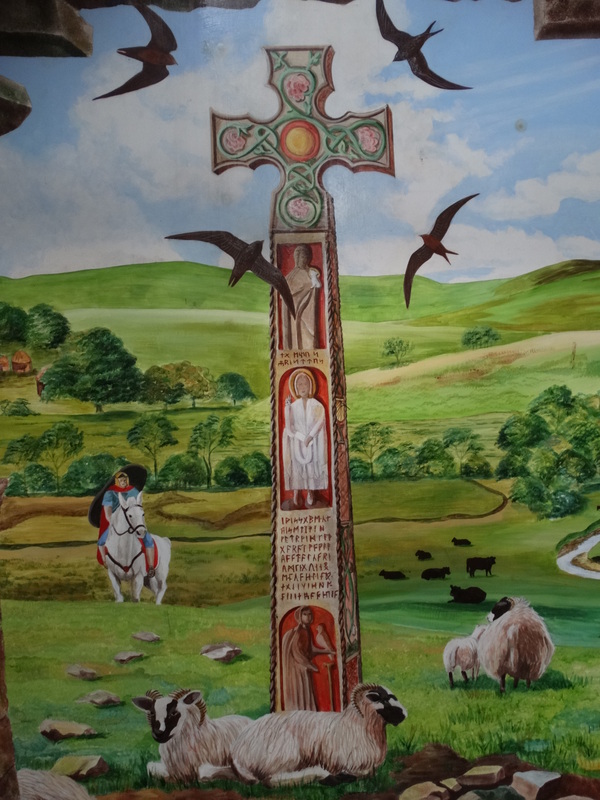 The Bewcastle Cross is one of the finest to survive from Anglo-Saxon Britain. According to the village website, which has a page written by the chap who is now Bishop of Huntingdon (and acting Bishop of St Eds and Ips), it has a Northumbrian style, rather than an Irish one. It probably dates from after 675 when Benedict Biscop brought masons from abroad (Rome and Syria) to work in building his new monastery at Monkwearmouth / Jarrow. This is a Victorian engraving of it. 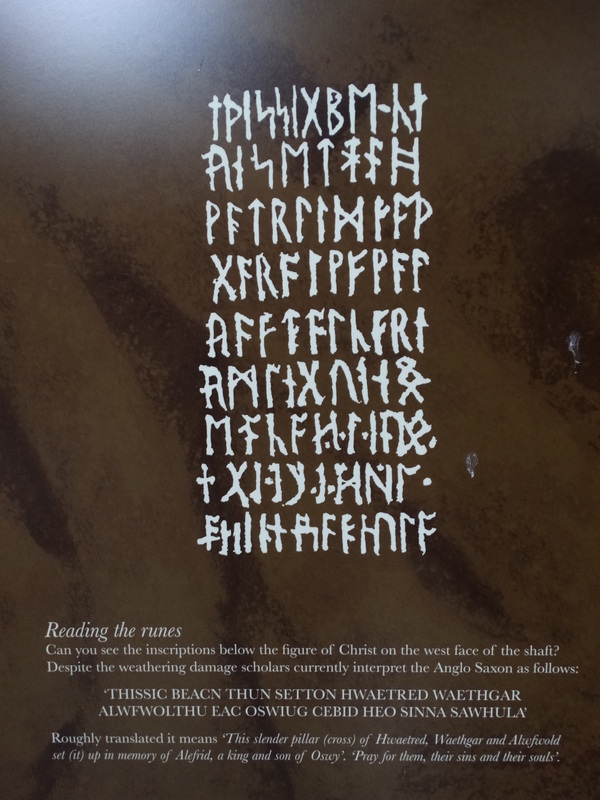 The runic inscription is now worn and damaged. 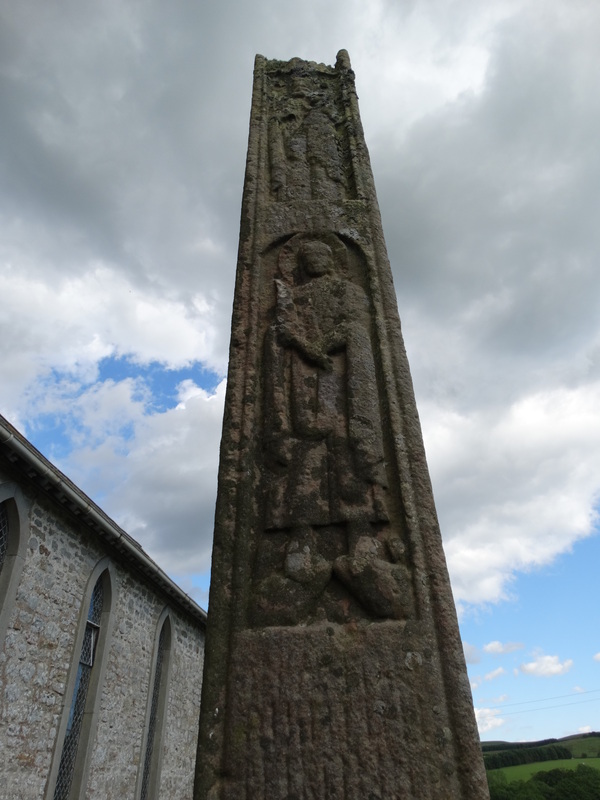 They may commemorate King Alchfrith of Deira, who made an unsuccessful bid for control of all Northumbria circa 664, and his wife Cyneburh. One story has it that he lived his final years in exile here. 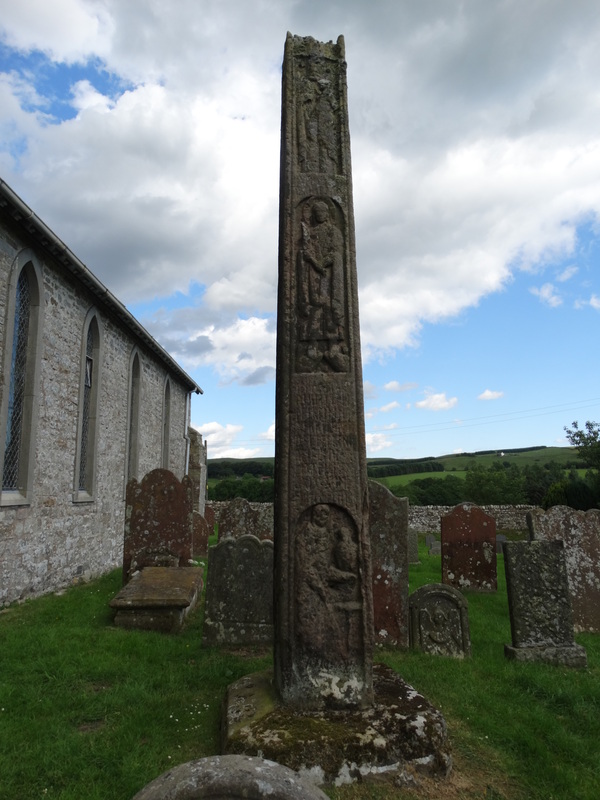 Others suggest the cross is later – during the reign of King Eadberht (737-758). Let’s quote, rather than paraphrase, the Bishop. 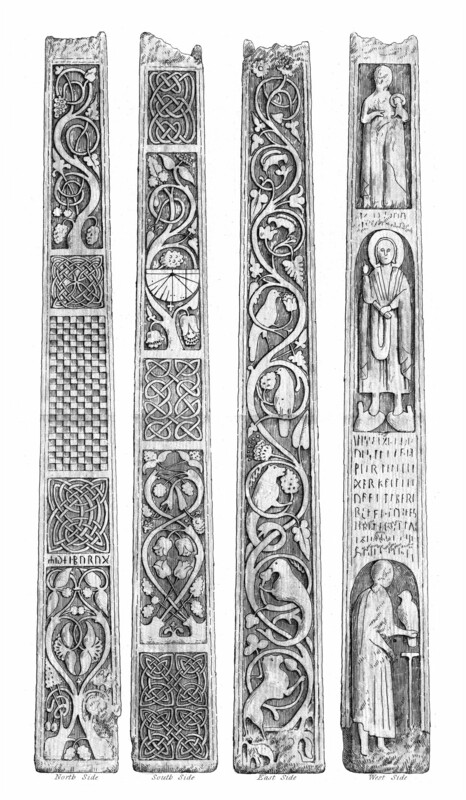 “The three figures on the Cross are crucial to its significance. The top one is John the Baptist, holding the Lamb of God, and walking on the desert hills, proclaiming Christ in the wilderness and directing our gaze to Him. Below is Christ himself as King and law-giver, being recognised by the animals of the wilderness who are at his feet. And then below the long inscription comes the famous and controversial figure of a man with a falcon or eagle on a perch beside him. It would be remarkable at this date to have a lay portrait, and of such size, on a memorial, though the figure clearly has echoes of an Anglo-Saxon nobleman. The figure we would expect is St John the Evangelist (whose symbol is an eagle), but if so he is depicted in a very unusual way. 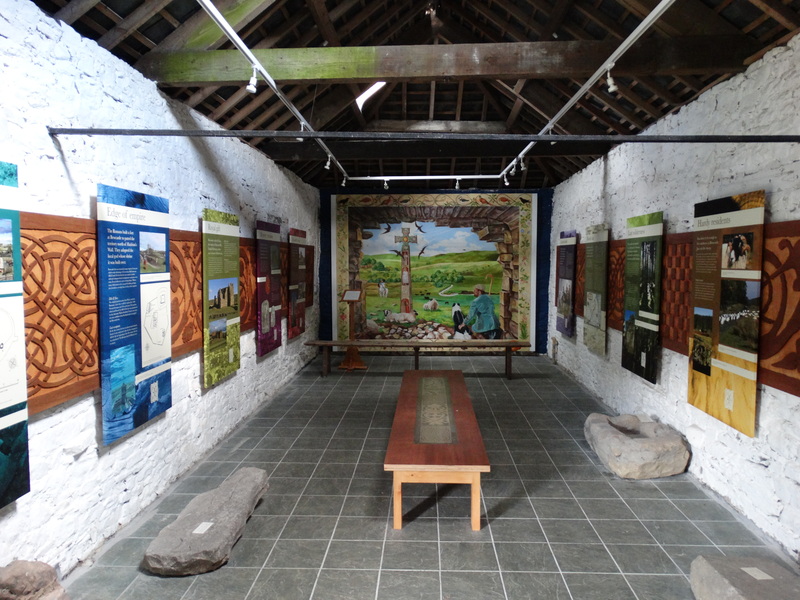 There is a small display in old outbuildings by the churchyard – the Hadrian’s Wall link is being capitalised on – and I liked the picture at the end. 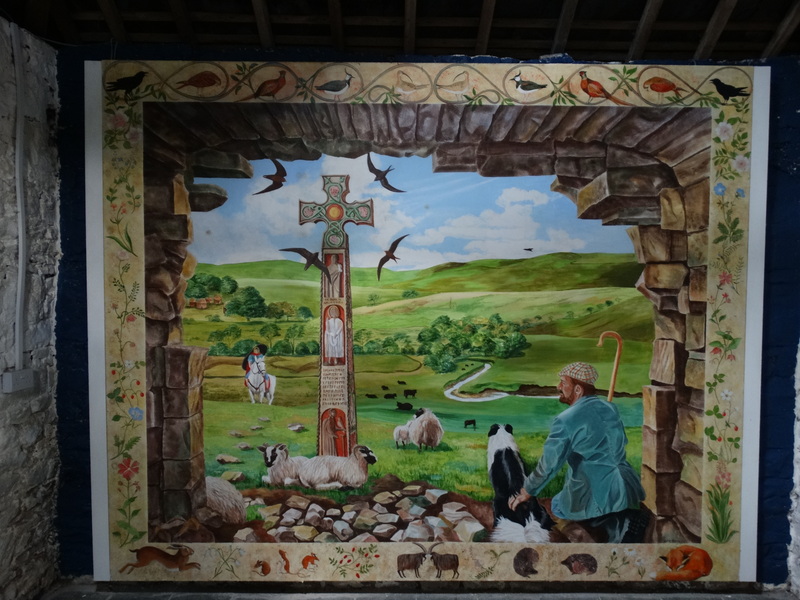 The mural is by Kate Norris and shows Bewcastle past and present, with the cross to the fore. A special place.